You really need a boat to enjoy this Park! You also really need a camera with a big lense to get any good photos! Can you find the eagle? How about the loon chick? Our destination for lunch was the Kettle Falls Hotel. It was in very bad shape when the Park Service took it over from the original owners. 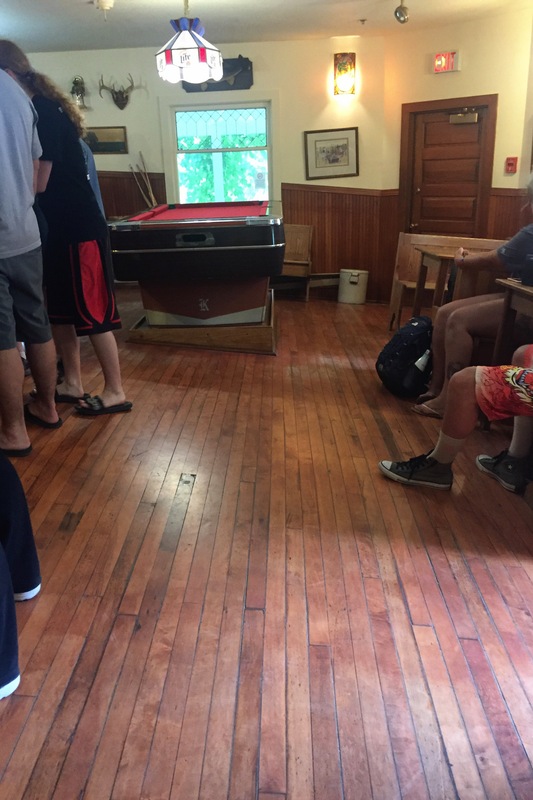 They fixed the foundations but reconstructed the bar with it’s very sloped floors for historic authenticity. There was one very hardworking waitress working the whole place! 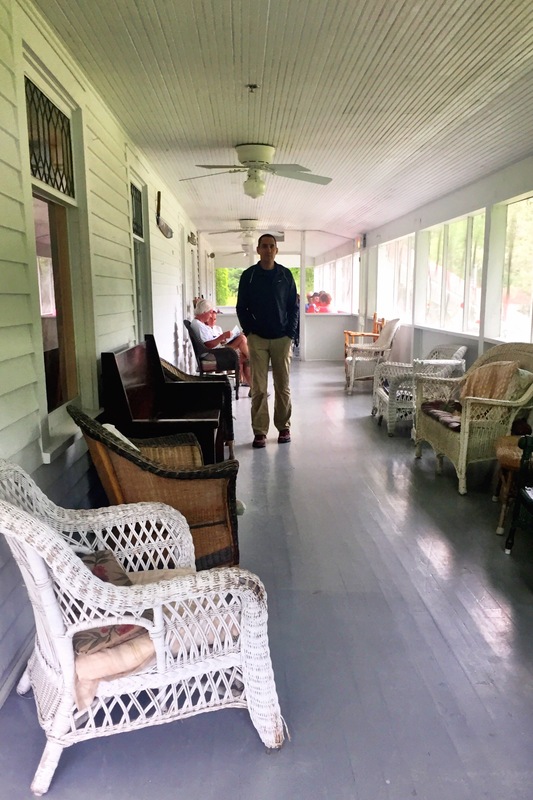 We got served fine but by the time we left this porch was crammed with people waiting to eat. There isn’t any other place to go if you are tired of fishing. They will fry up your own fresh caught Walleye. I’m thinking I should of had fish instead of a club sandwich to get the best experience. We did see a few of the other homes and resorts that were in the Park before it was a National Park. 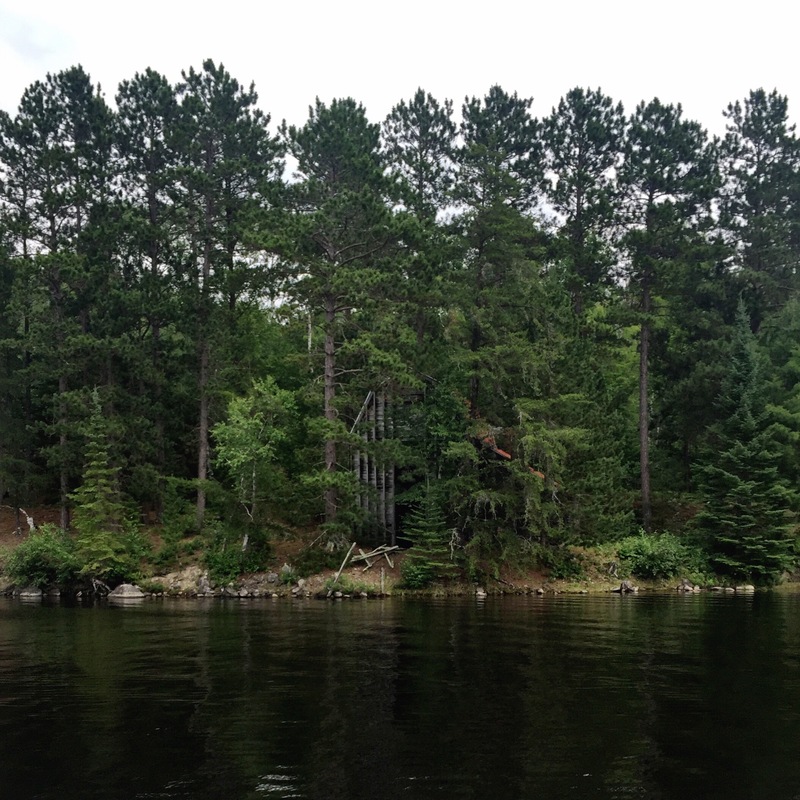 Here is an old ice house the owners built from lumber that had sunk in their bay. This whole area was heavily timbered in the past. There was so many logs coming through the area that they dammed Kettle Falls to allow for easier passage. The dam is still in place today. 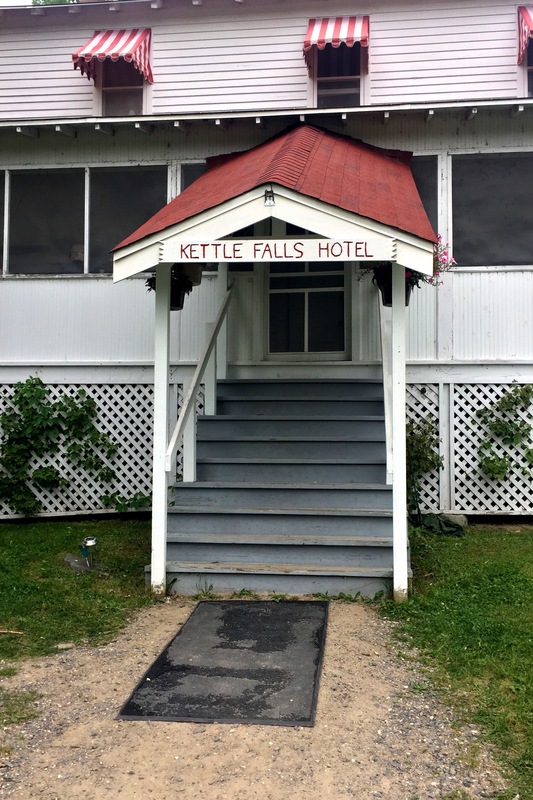 The Kettle Falls Hotel was originally constructed to house the workers who were building the dam. 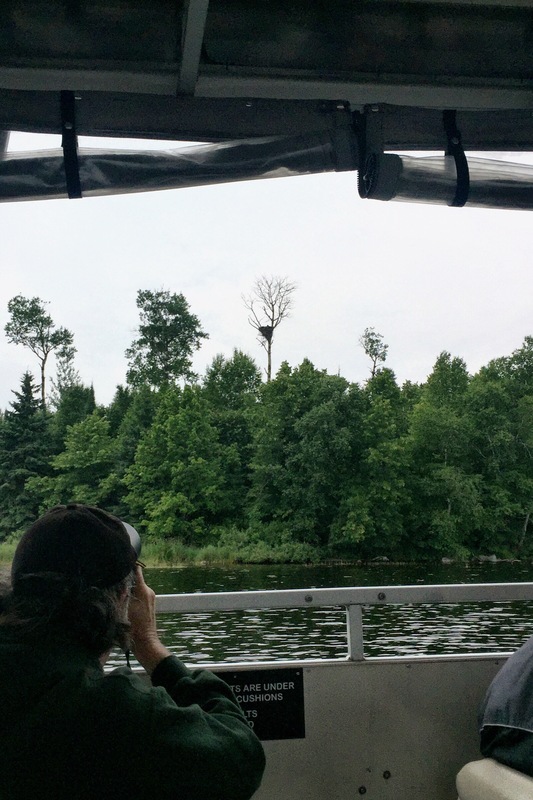 On the way back to the Kabetogama Visitor Center, we saw one more eagle’s nest. This one was interesting because we had seen photos of a climber in the tree grabbing a baby eagle for banding! 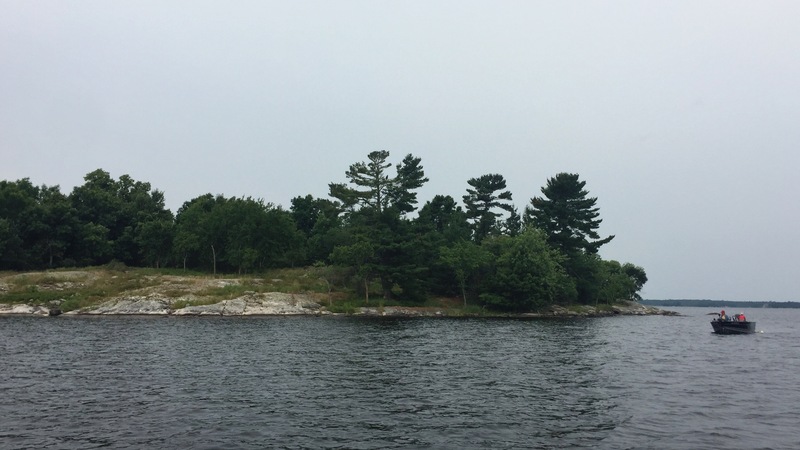 The Park Service estimates that there are about 50 active nests in Voyageurs National Park. This is an amazing recovery for an endangered species. Next stop: We have no idea! We’ve already spent a lot of time in North and South Dakota so we are thinking that we will stay here a few more days to get through the weekend and then head South. 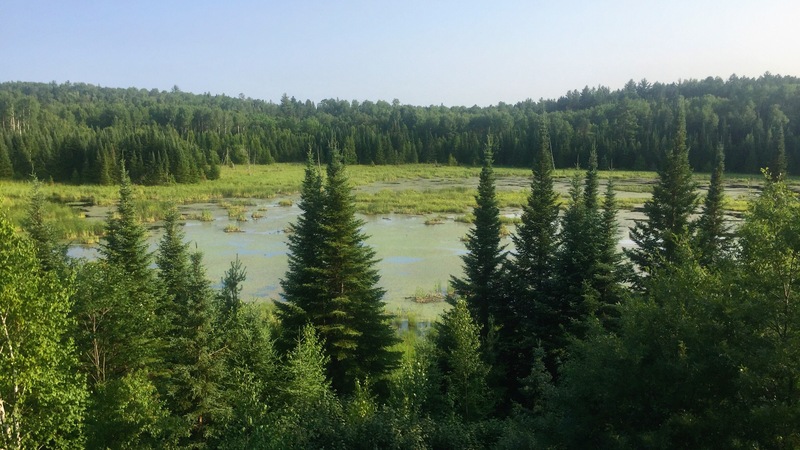 First to Itasca State Park to see the headwaters of the Missippi River and then turn towards Badlands National Park. We drove through there already but it might be nice to stay and explore a little while. 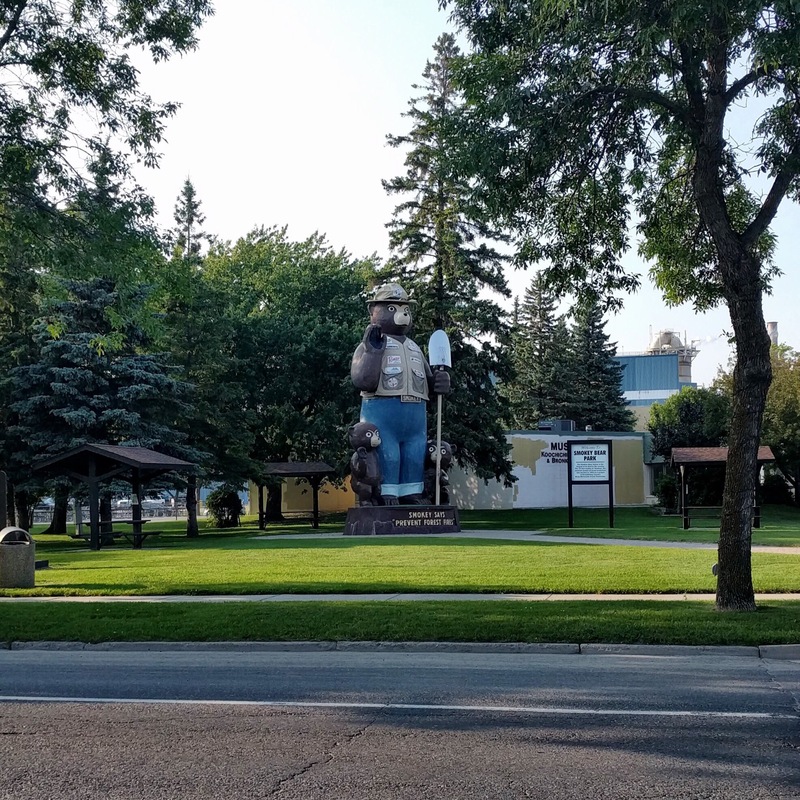 We couldn’t leave International Falls, MN without a picture of the big Smokey Bear with his cubs. Once we started planning our next stop, it worked out that we would stick around here through the weekend. 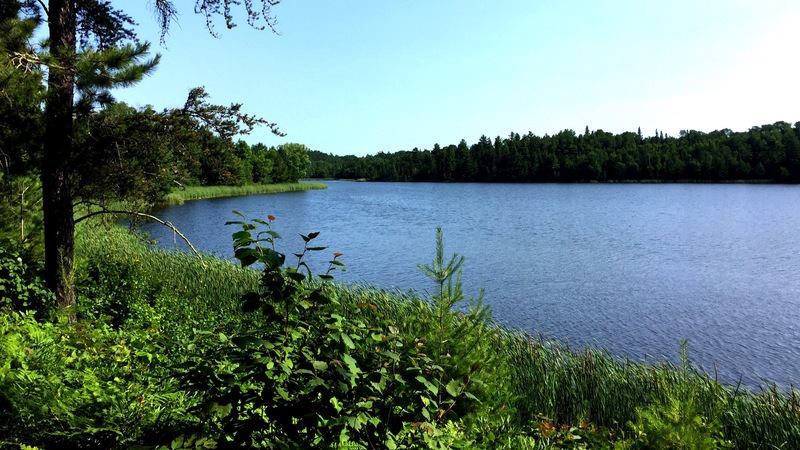 We want to finish our tour of the Mississippi River with a visit to Itasca State Park and see the headwaters. 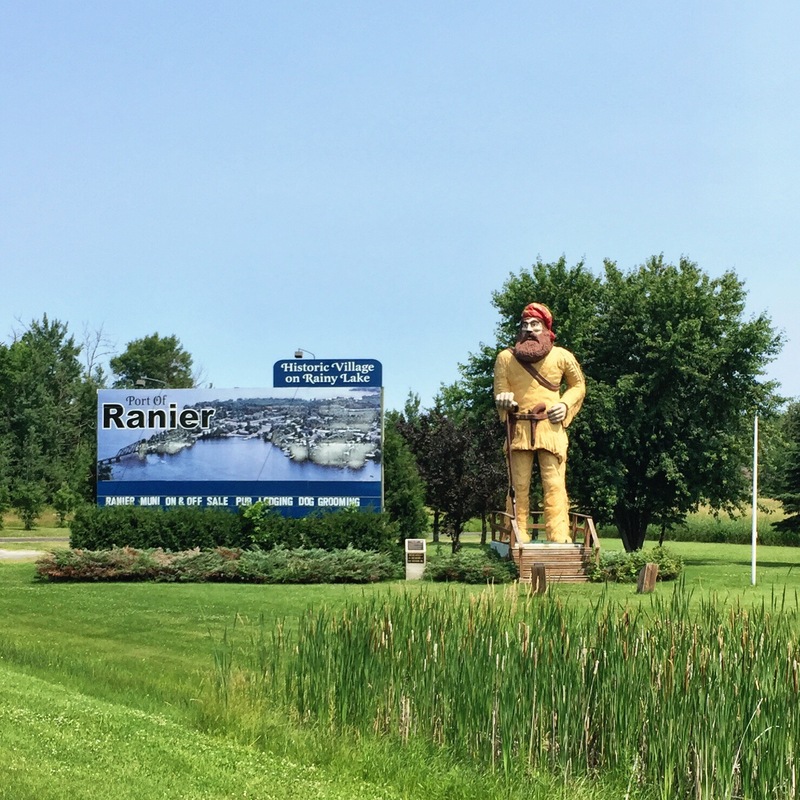 They were booked through the weekend so despite the hassle of having to move campsites, we are going to stay in International Falls until Sunday. 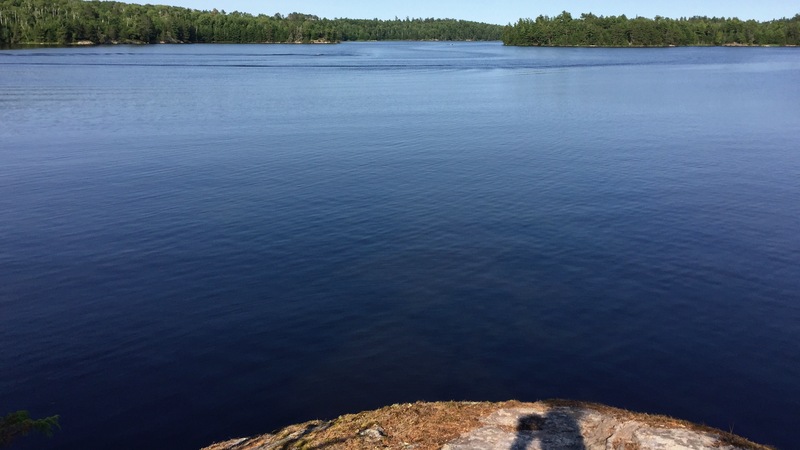 That meant we had another day to go hike around Voyageurs, check out the other two visitor centers and maybe find some blueberries. 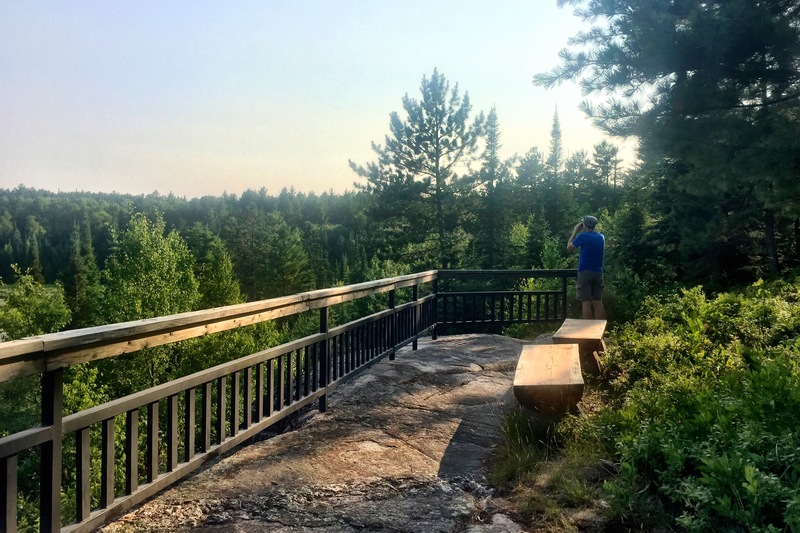 The Kabetogama Lake Overlook Trail at the Ash River Visitor Center was excellent. 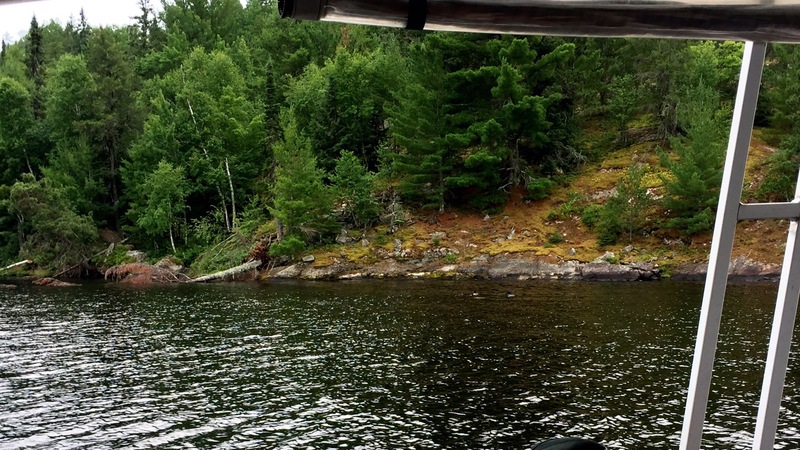 Beautiful views of the lake and plenty of blueberries. We also took the short hike out to Sullivan Bay. It was early evening and the boats were all heading in for the night. Beautiful view from a rock outcropping. 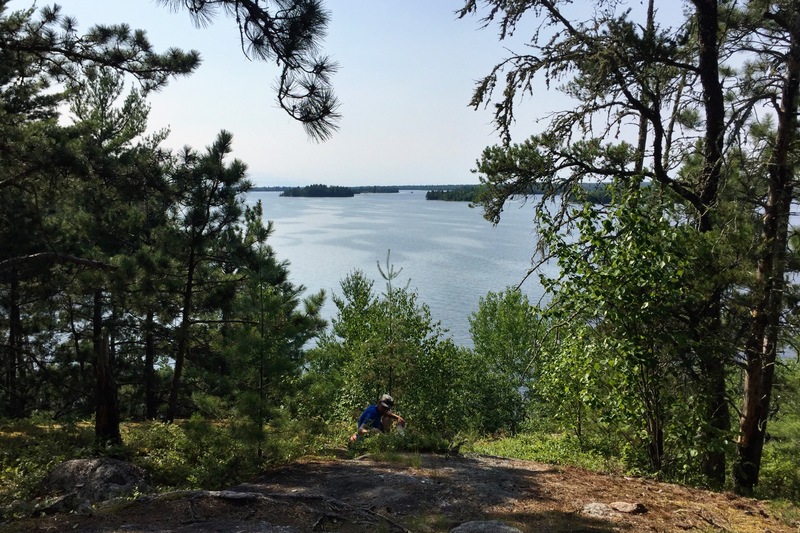 Our first hike had been at The Rainy Lake Visitor Center – the Oberholtzer Trail. There were a few raspberries but the views weren’t nearly as nice as our later excursions. We watched a pair of loons for a while hoping to hear them call to each other but they were too busy diving for dinner.